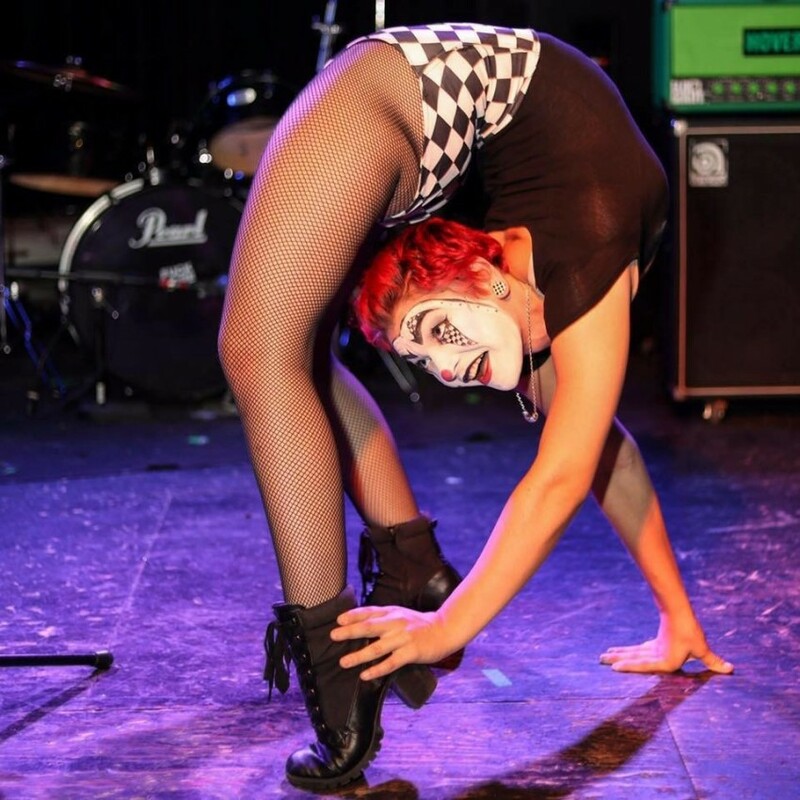 Scarlet Checkers is a circus performer specializing in the arts of contortion, sideshow, and clowning. She is unique, funny, energetic, and apparently confident enough to write about herself in the third person! Checkers is a natural born freak and an anatomical wonder! She was born with a genetic disorder that makes her joints and ligaments hyperflexible, allowing an extreme range of motion in her whole body! Checkers has displayed her talent on various TV channels and has mesmerized audiences around the globe, but her passion lies in performing interactive one-woman shows for intimate crowds. Checkers' show is a humorous medley of captivating contortion and death-defying sideshow stunts. 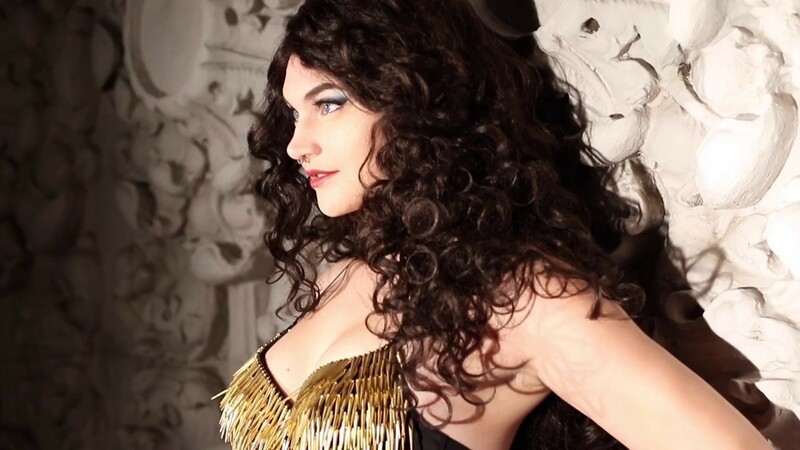 Checkers is dedicated to customizing her show to provide exactly what your event is missing! Her show is as flexible as her body! Whether you'd like an hour long family oriented stage show or an evening of strolling interactive entertainment for business professionals, you're sure to always remember the silly clown with the rubber bones! You won't know whether to laugh out loud or scream as you watch the one and only Clowntortionist squeeze her entire body through three hollowed tennis racquets! Checkers is said to be the only female contortionist who speaks during her act (in fact, it can be difficult to get her to stop!) Checkers encourages LOTS of audience participation. In her signature act, The Contortion Game, she dares audience members to think of physical positions that she cannot achieve. She has traveled the world playing this game, and has somehow remained undefeated! ...But you can never trust a clown to play fair. And if clowns freak you out, no problem! Scarlet can always ditch the face paint and provide an elegant and unique act that will keep people talking for years! She specializes in themed events, providing her own costumes to match any theme! Will there be a pool at your event?! Scarlet also performs contortion and character work in the water, or in a water sphere on the surface! Atmospheric contortion in a life sized bubble is always sure to make a splash! Want something a little more edgy? Scarlet is also a trained sideshow performer! She is always happy to amp up the danger factor performing acts including fire, swords, nails and sharp glass! Scarlet Checkers the Clowntortionist has been stretching the boundaries between contortion and comedy for 4 years. With a background in improv, she will always keep you on your toes! Checkers is a natural born freak and an anatomical wonder! She was born with the genetic disorder Ehlers-Danlos Syndrome (EDS), which affects the collagen in her body’s connective tissue. EDS makes her joints and ligaments hyperflexible, allowing an extreme range of motion in her whole body, even including hyperelasticity of the skin. With years of training, she was able to turn this condition into an impressive skill set, by learning the mesmerizing art of contortion. 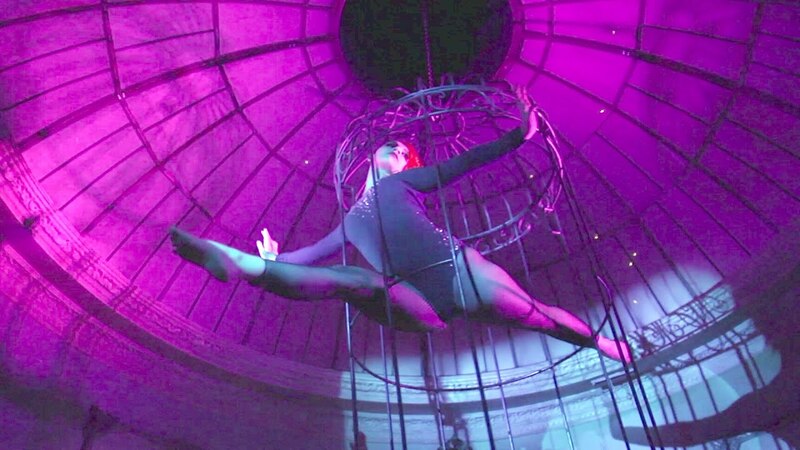 While contortion has always been her primary act, partway into her journey into a performance career, she discovered the sideshow arts. She currently performs many of the classic sideshow stunts such as the Human Blockhead, sword swallowing, glass walking, fire eating, the Human Pincushion, and others! A handheld microphone with a mic stand is always appreciated for a stage show, but not a necessity.